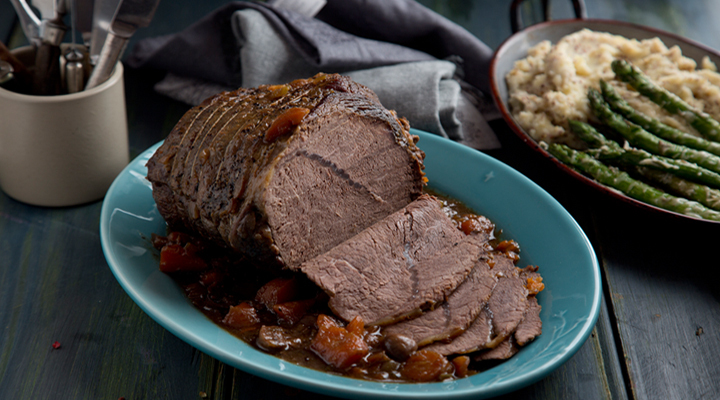 As this is a lean cut of beef with a little fat, long, slow cooking is best to get a lovely, tender roast supper. Season the beef generously with salt and pepper. Warm the olive oil in a large casserole set over a high heat and sear the meat all over. Remove the meat onto a plate, then add the carrots, onions, celery and mushrooms to the casserole and cook for 3 to 4 minutes. Pour in the stock and wine, then add the bay leaves and return the beef to the casserole. Bring to the boil and check the seasoning. Cover with a tight-fitting lid and transfer to the oven for 21/2 to 3 hours. Meanwhile, to make the mashed potatoes, place the potatoes and garlic cloves in a large saucepan of water and bring to the boil. Reduce the heat and simmer for 25 to 30 minutes, until the potatoes are tender. Drain the potatoes well, then place them back in the saucepan and mash with the butter and cream. Stir through the mustard until fully combined and smooth, then season with salt and pepper. Snap the woody ends off the asparagus spears and discard, then cut the asparagus in half lengthways. Place the asparagus on a baking tray, drizzle with the olive oil and season with salt and pepper. Toss to coat the asparagus in the oil, then sprinkle with the Parmesan. Roast in the oven for the last 15 minutes of the beef's cooking time. When the beef is cooked, lift it out of the cooking liquor and set on a board for a few minutes, covered, before slicing. Serve on some creamy mustard mash with the roasted asparagus alongside and spoon over the cooking juices.